Are you a working adult that is looking to earn a college degree but cannot afford the tuition costs or do not have the time to be a full-time student for the next 4 years of your life? Thankfully, there is a way to earn a bachelor’s degree without having to quit your job or cost your life savings. It’s a process called credit-by-examination that has been in use for several decades by working adults and military members earning a college degree in their spare time. When you hear the words college or bachelor’s degree, images of packed lecture halls or staying up late to study for a test. While many students live these scenes each day, there’s a smarter way to earn your degree. Instead of having to attend a class for every single college credit you need to earn, you can take a test on what you know already. Hence the term credit by examination. That means more hours to focus on graduating early, spending more time with your family, or being able to juggle the demand at work. Plus, taking a test is significantly cheaper than taking an actual college class for the same amount of college credit. You will start with CLEP tests that primarily focus on the 100- and 200-level college courses. These are the general studies classes (think English 101 or Psychology 101) that every student, regardless of major, has to take before beginning to study their core classes. There are currently 33 CLEP exams available to take. While some DSST exams will count as 100- or 200-level credit, most of the 30+ DSST exams are for the 300- and 400-level courses. As the final two years of college degree programs tend to focus on the “core” degree-specific courses, you will take these exams in the latter part of your degree program. How Much Do CLEP and DSST Exams Cost? As a general rule of thumb, both types of exams cost $100 each ($80 for the test plus a $20 testing center fee). If you’re like my wife, she was able to “test out” of her entire degree for less than $10,000. Keep in mind that the average 2016 undergraduate student loan debt of $37,000. As the average college class at an in-state 4-year university can cost $300 per semester, that’s a savings of about $200 per exam. Even if you only earn a few college credit through CLEP or DSST testing, the cost savings can offset your textbook costs. Can You Earn an Entire College Degree by Credit-By-Examination? Yes. Although you need to go to the right school. The state college just down the road from your house might only allow you to transfer up to one academic year of CLEP and DSST credits. Even then, they might only accept a few of the 60+ available tests, or, not even accept credit-by-examination at all. Other universities, specifically targeted for adult college students, are more lenient. Depending on the school and major, it’s possible to take a CLEP or DSST test for every single required course. Others might require some online courses or physically attending some core classes. Either way, this option is way cheaper than enrolling in the University of Tennessee or Ohio State University with thousands of other recent 18-year old high school graduates. My wife graduated from the first option and is the one she is most familiar with (obviously) but the others are good options as well. Yes. The program is particularly popular among members of the military because of their requirement to routinely deploy overseas and move every few years, earning a college degree in the traditional manner can be rather difficult. Also, the CLEP program is administered by The College Board. The same organization that also does the SAT college entrance exams and Advanced Placement high school program. Finally, over 2,900 colleges and universities across the United States accept CLEP or DSST exam scores for college credit. Is Credit-By-Examination the Best Option for Working Adults? Sometimes, adults choose to return to college to finish their college degree because they were too immature at age 18 or couldn’t afford college. Credit-by-examination is a DIY method to earn a college degree. This means you can save thousands of dollars, instead of following the degree program recommended by an academic advisor or college, but, need to be self-disciplined to study for exams and continue taking tests in the future. For the person that needs to have the carrot dangled in front or the classroom environment to ensure they complete their degree program, this most likely isn’t the best option. For those that want to save as much money as possible and save time (after all, there are more productive ways to spend our time than sitting through a college lecture), credit-by-examination, even for only one or two exams, can make it easier for any working adult to finally earn their college degree! 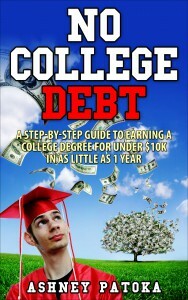 Do you want to learn how you can earn a college degree without a ton of debt? Thank you very much Josh for sharing this detailed post ..I am a working professional and I am planning to acquire a college degree…It was very helpful and I really enjoyed reading it. Congrats to you Emily for working AND pursuing a college degree. It isn’t an easy task, but, the long-term rewards can be worth it.